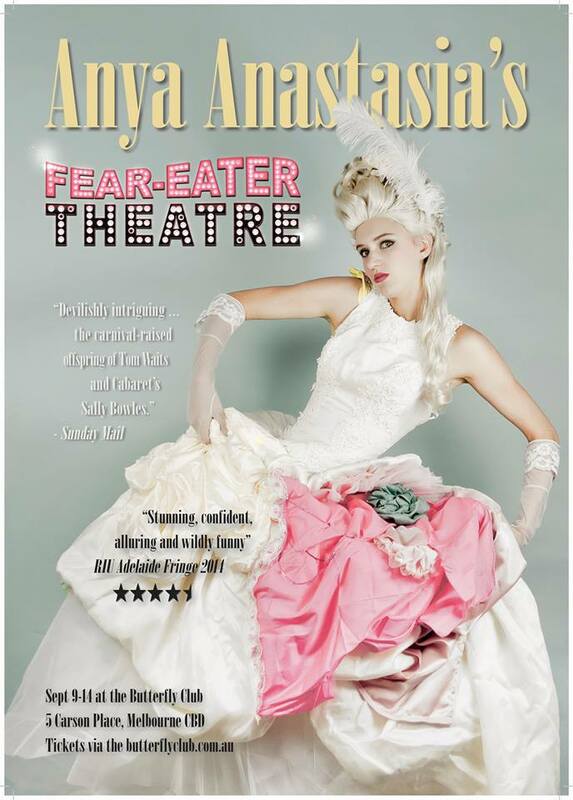 Anya Anastasia and her Fear-Eater Theatre will leaving Adelaide and making their way to their first ever full season in Melbourne in September. This accomplished singer, songwriter and entertainer known for her original blend of theatrics, music and comedy has toured Prague, Berlin and London in addition to Australia. For 6 nights only, a small theatre in the heart of Melbourne will be home to Anya's bizarre and beautiful variety cabaret and theatre show. Housing over 600 performances each year, The Butterfly Club off Little Collins Street is not only popular with the knowing public but also with professional performers, emerging artistes and the occasional superstar. For only $25, you too can enjoy a night of dazzling entertainment in a fantasy realm bursting with moving vocals, fairy tales, social satire and devilish humour from Anya and her Fear-Eater Theatre. The season is from 9 to 14 September but tickets are moving fast and the session on Saturday, 13 September is already sold out. To get a seat on this wild and spunky cabaret bandwagon, grab your tickets from the website now.